I’ve recently finished my painting for the upcoming “Wanderlust” exhibit at Modern Eden Gallery in San Francisco, CA. The painting is an acrylic on cardstock (it’s an actual postcard! ), roughly 6″ wide by 4″ high, titled Interdependence. The piece is part of my In Our Veins series though I created it with the show in mind. 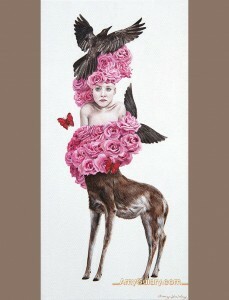 The exhibit will have an opening reception on December 13th at Modern Eden Gallery, from 6-10 pm. It will remain up through January 3, 2015. 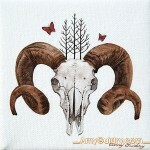 In the meantime, view my piece online: http://amyguidry.com/interdependence.html. 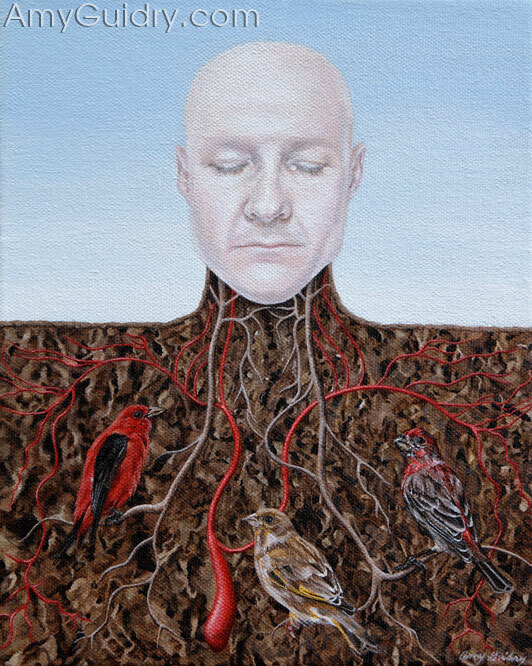 Another painting from my In Our Veins series has found a new home. Crutch is an acrylic on canvas, 12″ wide by 6″ high. It was also recently featured in the October issue of American Art Collector Magazine. 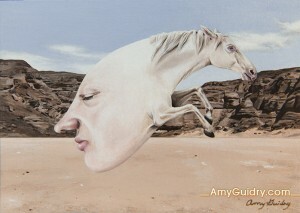 View the painting online (and the series itself) here: http://amyguidry.com/crutch.html. New postcards featuring Interrelated are in! 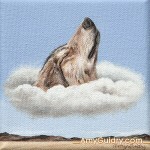 The painting is an acrylic on canvas, 6″ wide by 12″ high (and currently on exhibit at Gallery 549 in Lafayette, LA). 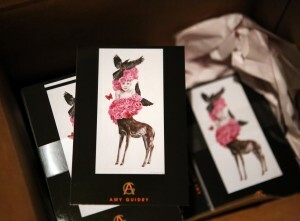 To receive a postcard, click on the postcard icon at http://amyguidry.com/contact.html. For those of you that are or will be in the Lafayette, Louisiana area this month, I have an exhibition opening at Gallery 549 in downtown Lafayette. I am part of this group exhibition featuring local and regional artists. The opening reception will be this Saturday, November 8th from 6-9pm. The opening is also held in conjunction with Second Saturday Artwalk the same day so all galleries will be open as well. The exhibit will remain up through the end of November.